Over the years, endless discussions have taken place about similarities and differences between man and other animals, especially apes.What use is a comparison with our nearest relatives when it is clear that knowledge about animal behaviour is not directly transferable to behaviour of modern humans? A comparison may open eyes and broaden one's outlook. At the very least the relevance of models and hypotheses derived from behavioural research on animals may be assessed in humans. Because of his evolutionary past, man is equipped with emotional predispositions which have contributed to succesful reproduction in the past. Ethological methods (systematic, comparative and direct observation in natural surroundings), ethological questions (into biological functions) and hypotheses derived from ethological research may contribute to enhancing knowledge about human behaviour. It is essential that these different types of contributions are not confused and that comparisons do not deteriorate into superficial extrapolations. Systematic ethological observations seemed eminently suited to study to behaviour of people during potential riots. The groups that form are always temporary, most involvees from different parties (hooligans, demonstrators, police officers) do not know one another personally, a lot of communication is non-verbal. By observing a lot of situations, it was possible to make comparisons between situations that did and did not escalate. By directly recording observations, I did not have to depend on the memories of the people involved to gather information. 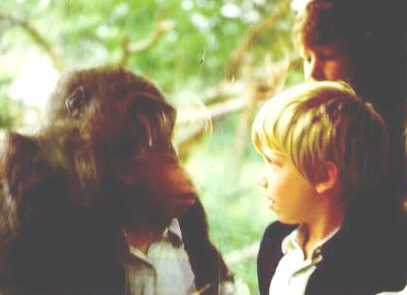 The parallel with my chimpanzee investigations was entirely in the method. No comparison or application of hypotheses was involved. That would have been weird, because violence during riots is performed mainly by young males during or after puberty, collectively and directed at targets from other groups. It is incomparable with the individualistic teasing of groupmembers by (male and female) chimpanzee pre-pubertal youngsters. Nevertheless, many media suggested that I extrapolated my chimpanzee findings to football hooligans. 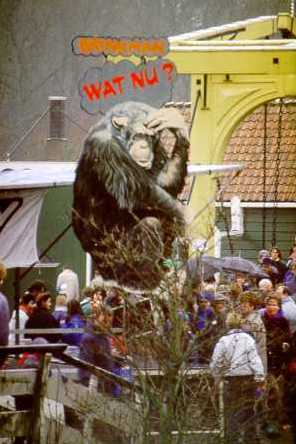 The Wall Street Journal wondered why the Dutch government commissioned a study on hooliganism to an animal researcher and stated that I had reached the conclusion the football violence is nothing but the posturing of adolescents, similar to the behaviour of young chimpanzees. More publicity about "football apes" followed. Even more serious commentators wrote that "football fans have something animal, they act according to a primitive kind of honesty which makes them both repulsive and intriguing in more civilised eyes". Not only hooligans were put on the same line as chimpanzees. 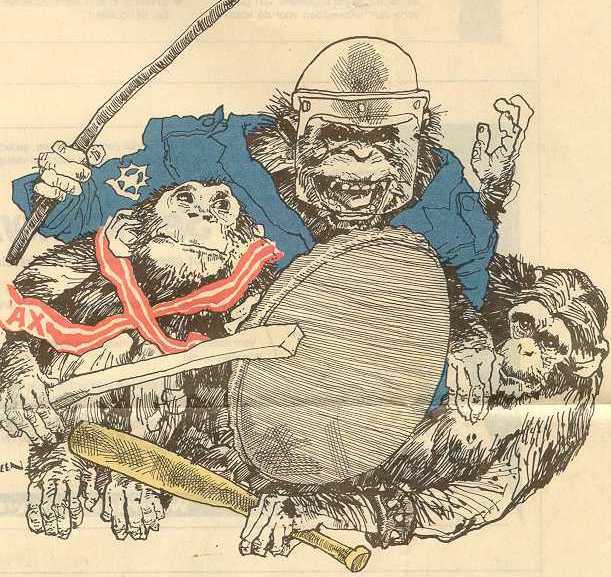 Some cartoons showed riot police with chimpanzee faces. In my chimpanzee study, I described how young chimpanzees tease and provoke adult groupmembers. Teasing, harassment and bullying in humans, especially between children, has become a hot topic in the last few years. Harassment may lead to systematic terrorisation of a child. The victim will be kicked and hit. Possessions are taken away or destroyed. The child will be called names, made ridiculous or may become an outcast. Differences in behaviour or clothes may be taken as an excuse to bully. Harassed children tend to feel lonely and unhappy. Some commit suicide. Studies on harassment and bullying often point at frustration as the main cause. Or at a disruption of the balance inside school classes. The social skills of bullies and victims might be insufficient. Educationalists, psychologists and teachers make efforts to help victims and fight harassment and bullying. A lot of educational material is produced, there are videos and self-help groups. However, it remains unclear what the foundation for these initiatives is. Yes, there is research in the form of questionnaires, selfreports and interviews with pupils, parents and teachers. This research makes clear that the problem is real, especially in primary schools. But an adequate description of teasing, bullying and interactions between bullies and victims is lacking. The word "harassment" is used for a wide array of interactions, ranging from the way children treat one another, to the way they pester teachers or other authority figures and to the way adults may terrorise one another, e.g. at work. Are we really talking about comparable behaviours here, with comparable causes and effects? We do not know. There are no systematic observations of human harassment. Ethological observations could prove helpful here. And there is another use for ethology as well. Certain types of questions are never adressed in studies on teasing human children. During the larger part of our evolutionary past humans lived in small groups, in which children interacted with other children of all ages. What are we effects of sorting children according to age and putting them together most of the day in a class with one adult supervisor? Did teasing and harassment at one time fulfill a biological function? Is there a clear distinction between bullies and victims, or may children take both roles in the course of their development? Those are the types of questions an ethologist would ask. And, bearing in mind the results of the chimpanzee research, is the teasing and harassment of human children maybe partly aimed at reducing uncertainty or investigating authority? Is bullying a function of the relationship between children, and not simply the result of individual characteristics? We don't know and it would be interesting to investigate the connection between harassment and the responses of victims. For that, systematic observations are called for. In the schoolyard. "It's an insult and I will sue him!" "A researcher from Utrecht University sees similarities between chimpanzees and football hooligans"
According to Boesch and Tomasello, the differences in cultural evolution between humans and chimpanzees can be primarily attributed to two factors. Humans possess a more complex language, allowing cultural dissemination to take place over greater lengths of time and spatiality. Human culture also incorporates the ratchet effect, permitting cumulative modifications to occur that create increasingly elaborate cultural practices.